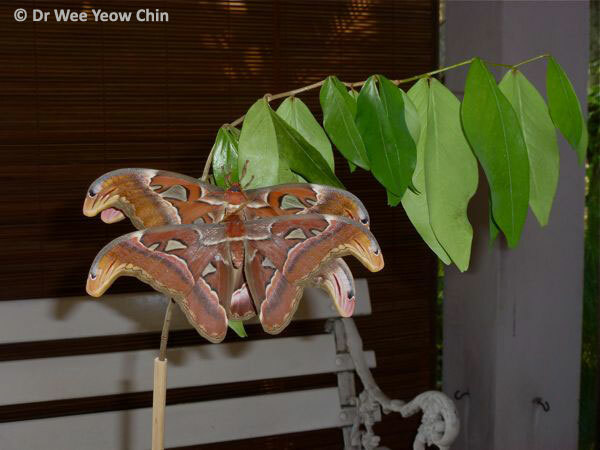 After sharing his meticulous documentation of the life cycle of the Atlas Moth (Attacus atlas) in Episodes 1 and 2, Dr Wee Yeow Chin returns to complete his story in this final episode of the Atlas Moth Chronicles. Episode 2 describes the development of the caterpillars ending in eclosion. However, there was one case that did not end right. The pupating caterpillar somehow ended on the tabletop and began to lay down its silk. Not happy with this, I moved it to a branch with larger leaves (Bridellia sp.) than the original Limau Purut (Citrus hystrix). It continued to lay silk on a leaf for the next 48 hours. 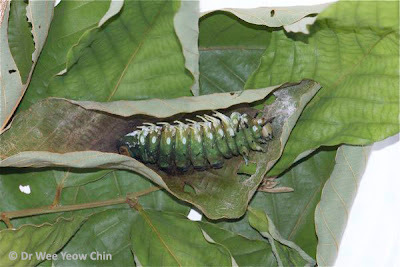 Because of the larger leaf size, the caterpillar wasted its silk, leaving none to cover itself. So it ended up as a “naked” pupa. On the 12th day the caterpillar underwent a final moult, leaving a crumpled mass of old skin on the leaf. 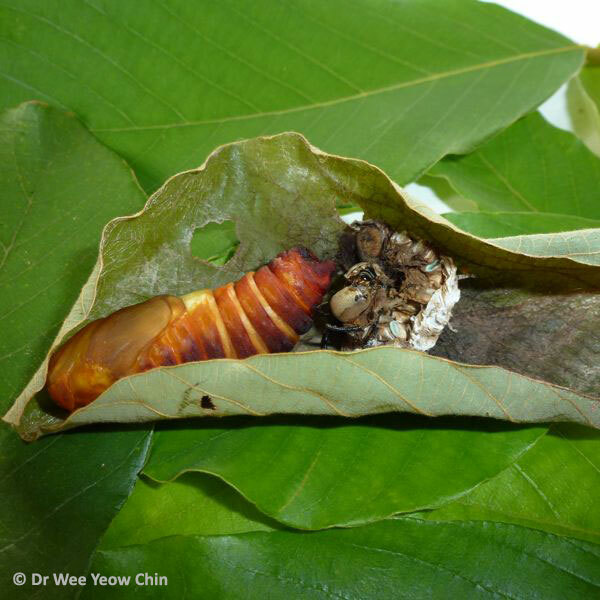 From an unattractive, dried looking caterpillar, it turned into a colourful pupa showing the various parts of the future moth. 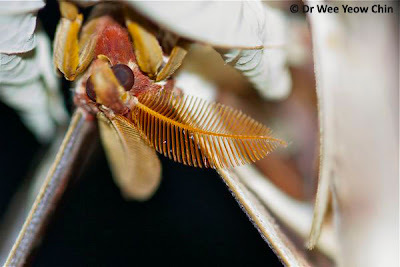 Notice the abdominal segments, folded wings, antennae, mouthparts and head. The pupa wriggled whenever disturbed. 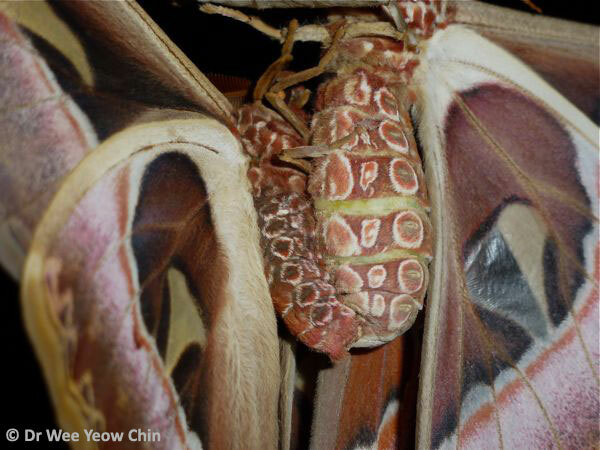 The next major change would be eclosion, where the emerging moth leaves its skin behind and crawls out of the silken case. In this particular case I would be able to follow the process unobstructed. Unfortunately I missed the crucial moment. I have only a dissected empty pupa case to show the moulted skin as well as the pupa skin inside the silken case after eclosion. 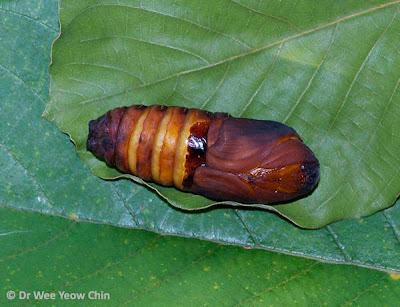 Eclosion for this naked pupa occurred at 29 days. I only realised what happened when I found a ragged moth with crumpled wings in the dish it was in. 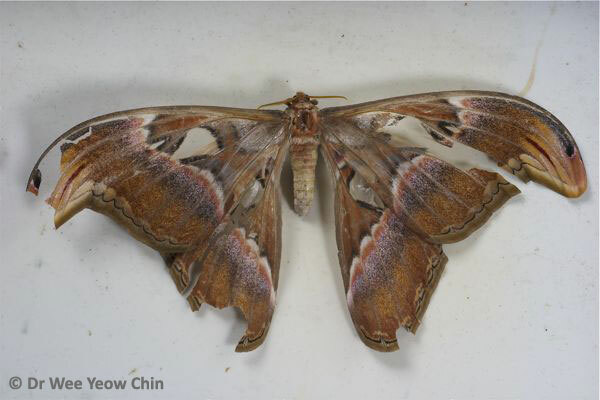 Apparently the emerging moth failed to crawl over the side of the dish and so its wings failed to expand. When I later experimented with removing the top covering of the pupa case to observe the development inside, I found the emerging moth at the edge of my computer table hanging onto a wire until its wings expanded. I had left it on a flat surface but again missed the crucial moment. It was a female and it successfully mated the following day. The moth with the crumpled wings was left hanging from the edge of a leaf and attracted three to five male moths every night for the next seven nights. However, not a single male copulated with this strange looking female but remained around till nightfall. Was it possible that the female failed to give the necessary courtship signal? Or was it because the males failed to recognise her as a female as her wings were not expanded? In the absence of copulation, she laid about a hundred unfertilised eggs, none of which subsequently hatched. 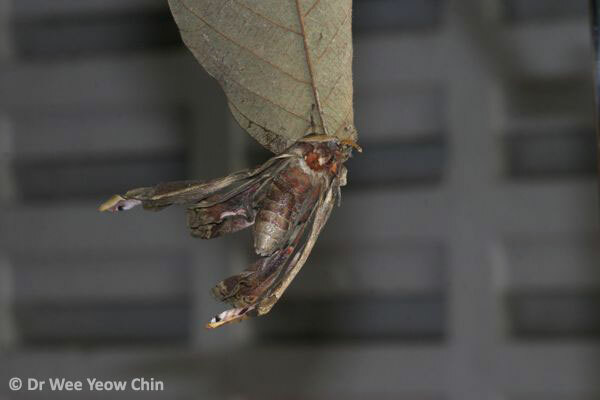 In all instances of eclosion the emerging moth remained clinging to the pupa case until nightfall. 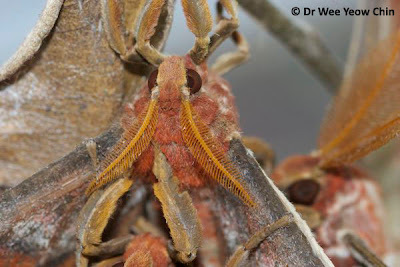 When it was a male moth, verified by its pair of wide antennae, it would fly off sometime during the night, apparently to seek out newly emerged females. 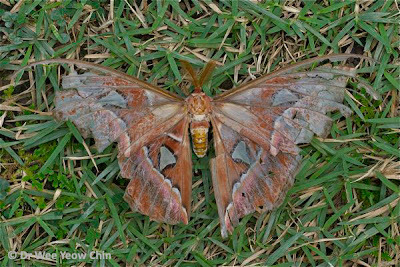 The wider and more elaborate antennae are presumed to enable it to better detect the pheromone discharged by females some distance away. 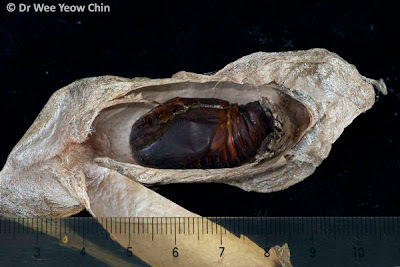 However, an emerging female, with narrower antennae, always remained attached to the pupa case to await a visiting male or males. Males arrived during the early morning. 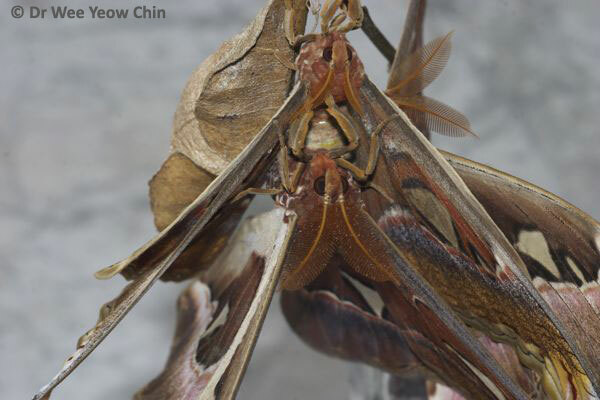 The first to arrive immediately attached itself to the female. A second male would sometime also cling on to the female. Latecomers simply waited nearby, to fly off the following night. Where there were two males per female, the tip of the abdomen of the first male would make connections with that of the female, thus excluding the second male. The pair remained thus for up to 11-20 hours after which they disconnect but remained attached. 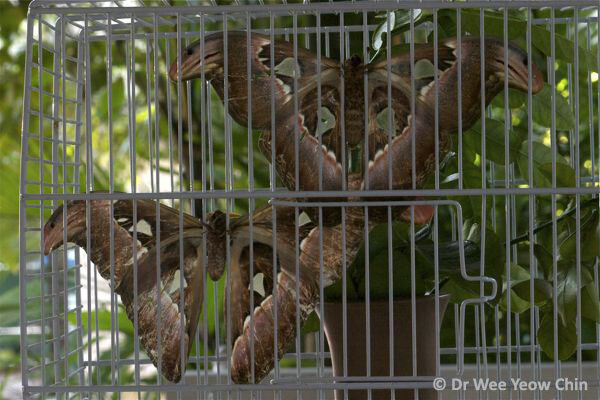 Then they flew off, the male probably to seek out another female and the female to lay her eggs on a host plant. To collect the eggs, it would be necessary to cage the pair before they disengage. Egg laying went on for a few days under captivity, giving a total of up to 200-250 eggs per female. The female remained alive for only a few days more. A few of the males that arrived to mate with the newly emerged females failed to survive the next day, dying in the garden, their bodies disintegrating and became food for ants. They probably had visited other females previously before arriving. It was noted with the second batch of 18 pupae that the first wave of emerging moths was males. Females generally emerged later. 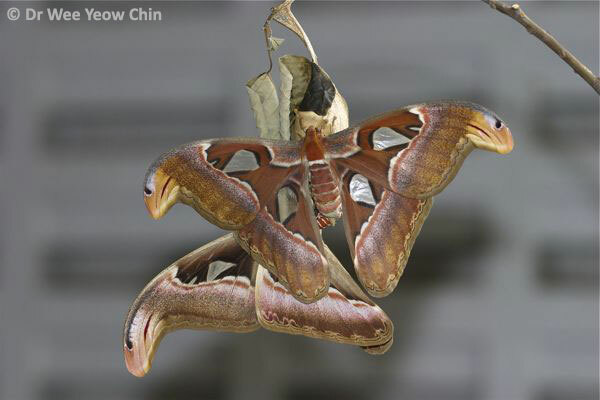 The number of days from start of pupation to eclosure was 22-23 days for males and 23-25 days for females. This would mean that caterpillars that would develop into male moths had a shorter pupa stage than potential females or they started to pupate a few days earlier. Having males eclose earlier can be a mechanism to discourage inbreeding. The males would have long gone before the females emerge. 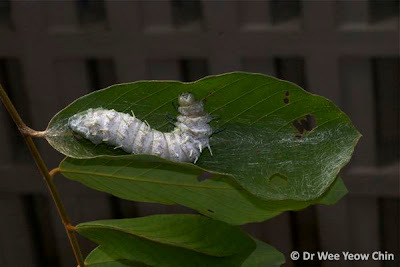 There is also the possibility of caterpillars “which eventually turn into adult females to pass through one instar more than those which develop into males," as suggested by Henry Barlow. But I failed to detect this in my caterpillars. 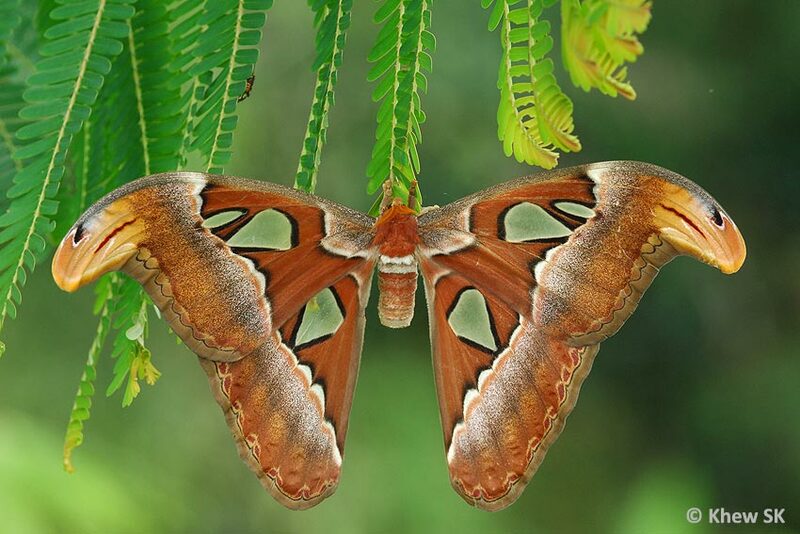 i'm writing an article about the Atlas moth just now and i'm desperately need some good pictures to be put in my article. so, i would like to ask permission from admin ButterflyCircle to use some pictures from this blog. i'll ensure that all the pictures stated with the your copyright. Most of the photos in the article were taken by Dr Wee YC. Let me know which of the photos you need and I'll link you up with him if needed. 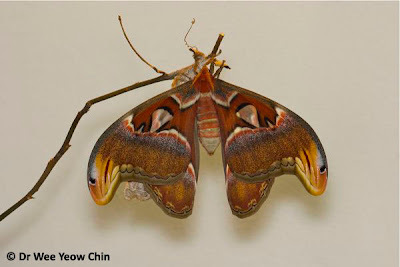 Similar to above, I am currently working on a species page project for the Atlas Moth and I would like to obtain the permission to use the photos of the Atlas Moth by Dr Wee YC and Mr Khew SK. Please be assured that proper accreditation will be given for the photos. Hope to hear from you soon!